We have not been idle over the last few months. A major piece of development if currently underway to totally redo how we handle Print Jobs from iOS devices. 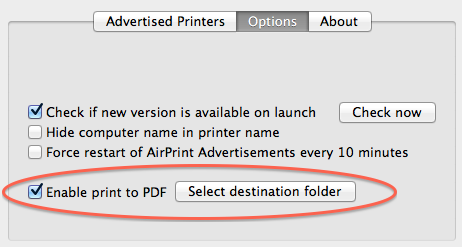 In the past we simply made sure the iOS devices were seeing the printer advertisements. After that all communications between the iOS devices and the printer was out of our control. With v4.0.0 we are introducing a full printing engine that will handle all print activities between the iOS devices and the actual printer. This will allow us to better control paper size, color vs blank and white, etc, etc. Are you working on creating a launchdaemon for this program so that you don’t need to login in order for it to work? It’s annoying that whenever you restart the computer, this useful piece of software seizes to work.